Conference poster designed by BOWB. Ten years ago almost to the day this event, the first Sequential Art Studies Conference took place on April 19 2002 in Sydney at the University of Technology. The conference was named after the descriptive term for comics, sequential art, introduced by Will Eisner in 1985. Thank you Will! Convened by Jeremy Allen and myself, with panels chaired by Jeremy, Spiros Tsaousis and I the conference was held in association with Supanova Pop Culture Expo with support from Daniel Zachariou. 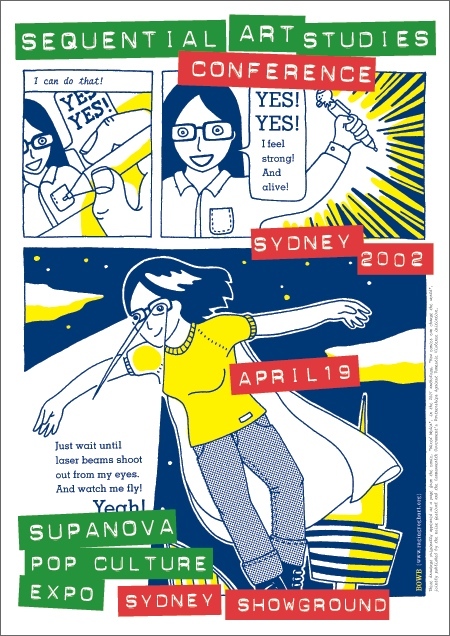 This was, to my knowledge, the first scholarly conference on comics studies to be held in Australia, more than 3 years before “Men In Tights” at Melbourne University in 2005. The conference poster was designed by BOWB. Abstract: This paper involves an examination of the contemporary Australian alternative comics scene as a lively form of lampooning and derision in the late 20th Century. In contrast to the mainstream print media, many of the artists, creators and cartoonists involved antagonise, irritate and ridicule with their graphic humour and horror, provoking irreverent laughter as well as an element of fear and amazement within their limited audience. In so doing, they take advantage of what is a relatively unregulated outlet of creativity and visual communication. As a wide-ranging group of artists, their repertoire houses a mix of graphic styles and comic art genres and their attitude has strains of ‘larrikin’ and ‘ratbag’ humour. Bio: Michael Hill is Senior Lecturer in Visual Communication and Director of the Interdisciplinary Studies Unit at UTS and partner in Graber Hill, publisher of the independent comic B.L.A.CK. Abstract: The export of manga (Japanese comics) from Japan to Australia is a journey from erasing race and culture to redrawing ideal bodies and communities. Using my two years of field research in Tokyo I argue that the export agenda of Japanese animation distributors is based on the erasure of Japanese racial characteristics and life-style to allow for easier localisation of animation and comics such as Astro Boy, Poke-Mon and Dragonball Z (Iwabuchi, 1998). I compare these producer-dominated ‘erased’ manga with the ‘redrawn’ manga of fan artists throughout Australia. I focus on the work of a number of manga fan-artists based in Sydney whose work appears in fan-zines, online, and on more unusual surfaces such as car-body art work. Bio: Craig Norris is a PhD candidate at the University of Western Sydney. His research interests include cultural globalisation, audience-studies, and Asian/Australian popular culture flows. Abstract: Over the last seven years the web has emerged as a focal point for comicsculture. It is a place for fans to connect, for the purchase of latest titles and back issues, for comic news to be broadcast, for upcoming comics to be ‘spoiled’, and for established comic companies to advertise. Significantly, it has also given a mass media voice to aspiring comiccreators. In this respect, the web has become a gallery of online comics to be appreciated by potentially millions of people across the world. It is through this new method of distribution and new form of comics that the Internet has perhaps had its most revolutionary impact on comics, by producing a true alternative to the ‘offline’ comics industry. Bio: Jeremy Allen is currently researching his Ph.D. on Online Comics on an Australian Postgraduate Award Scholarship in the Faculty of Design, Architecture and Building at the University of Technology, Sydney. Abstract: Skateboarding is an activity full of dynamic action and motion. Inevitably, attempts to capture this phenomenon require communication of this movement. Representing movement in print has obvious limitations and the most obvious solution is that of the photographic sequence. In this paper, it will be argued that these sequences can be read much like a comic strip. It will be demonstrated that they not only share characteristics of comic strips, but have developed alternative processes that could be of use to the comic creator. Bio: After falling into the cauldron of magic comics as a baby, monsieur Magnoonis has been addicted to the medium ever since, currently studying visual communication and creating the mini comic Pepe’s Quest. Abstract: Many artists and new animators work with desktop Mac and PCs at home or in schools and colleges. Great ideas can be well expressed using alternative approaches without resorting to high tech wiz bang special effects. New media and interactive multimedia technical restrictions have forced alternative animators to think big and work small. This talk will focus on practical and conceptual issues at play in working in multimedia. Bio: Kurt Brereton is Adjunct Professor in Computer Based Art & Design at the University of the Sunshine Coast and the University of Technology, Sydney, Managing Director of Spark Interactive and an internationally represented visual artist, photographer and film maker. Abstract: Modernist spatiality evidenced two strains – one orderly, mechanistic, logical and gridbased; the other fluid, dynamic, a transvaluation. However the rational and orderly exhibits the symptoms of anxiety, containing within its formulation the seeds of its unconscious propensity toward disorder and fluidity. Broadly tracing the spatial development of the comic strip from, say, Hogan’s Alley to Little Nemo to Krazy Kat evidences the movement of the medium between the two poles. In this paper I assert that the ‘logic’ of Krazy Kat is made coherent, legible and thematically consistent with appeal to its representation of space and place; and that its spatial presentation – its design and rearrangement of the comics page – is a significant departure from the relatively uniform and stable arrangements of comic strips such as Hogan’s Alley and Little Nemo. Bio: Spiros Tsaousis has recently completed his thesis, “Disturbance of Distance: Postmodern Spatiality and the Comic Strip, Comic Book and Graphic Novel”. He has presented and published a number of papers on comics. Abstract: Even if since the 1990s there is an emergent community of comic book artists, Comic Books in Australia appear to be negatively stigmatised as immature literature in everyday life and in academic spheres. Even if comics started in newspapers as a way to attract working class adults to buy newspapers, and later became a literature form aimed at young readers, this medium has reached its Lettres de Noblesses and has been recognised as an art form since the 1970s in Europe, Japan, and the USA, but NOT – as it appears – in Australia. The aim of this paper is to describe the social construction of comic books as an immature literature in Australia since WW II. Bio: Adam Possamai lectures in sociology at the University of Western Sydney. His doctoral thesis won the Jean Martin Award for the best PhD in Sociology submitted in Australia during 1998-9. Note: Jeremy Allen is now known as Jeremy Kerr and Spiros Tsaousis is now Spiros Xenos. This is the seventh in a series of posts called Archives of Australian Comics History that document moments in the recent history of Australian comics, particularly alternative comics and the Australian Small Press. I started researching this subject in the late 1990s and it eventually led to my PhD thesis: Ph.D. Macquarie University, Division of Society, Culture, Media and Philosophy, A Study Of Contemporary Australian Alternative Comics 1992-2000 With Particular Reference To The Work Of Naylor, Smith, Danko And Ord, 2003. On completion of the research I donated the materials and comics I had collected to the National Library of Australia: Michael Hill Collection of Australian Comics. This entry was posted in Archive of Australian Alternative Comics, Art, Comics, Japanning and tagged Adam Possamai, BOWB, comics studies, Craig Norris, Jeremy Allen, Kurt Brereton, Michael Hill, Spiros Tsaousis, Spiros Xenos, Zeldz Magnoonis by Doctor Comics. Bookmark the permalink.